Real life can be messy, tricky, and sometimes down right tough. So we are sharing our Real Gal Advice for making life a little less messy, a little bit easier, and a lot more fun. Check back often for our favorite tips, tricks, and life hacks. Prevent ice or frost from forming in your car windshield, windows and side-mirrors by making this simple solution. 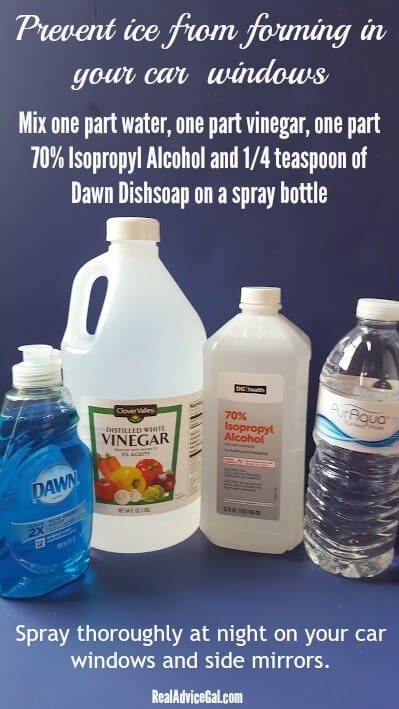 Just mix one part water, one part vinegar, one part 70% Isopropyl Alcohol and 1/4 teaspoon of Dawn Dishsoap in a spray bottle. Shake well before use and spray thoroughly at night to prevent ice from forming. Got ice or frost on your car windshield, windows or side-mirrors? 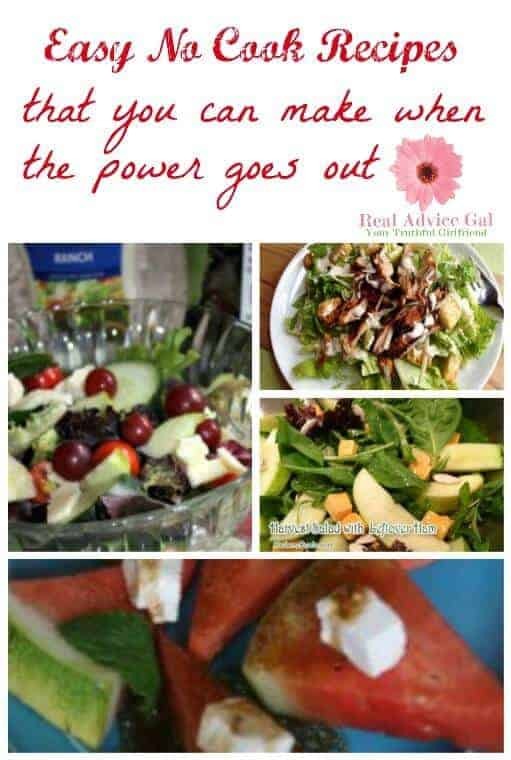 Don’t worry this simple two ingredient solution is what you need. 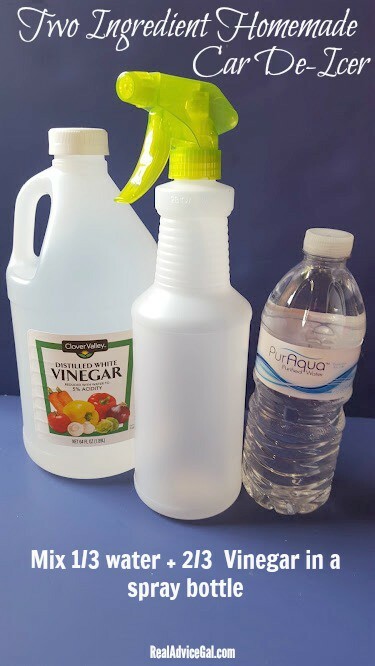 Just mix 1/3 water + 2/3 Vinegar (or you can also use 70% Isopropyl alcohol) in a spray bottle and voila an instant car de-icer solution. No need to buy microwave popcorn. 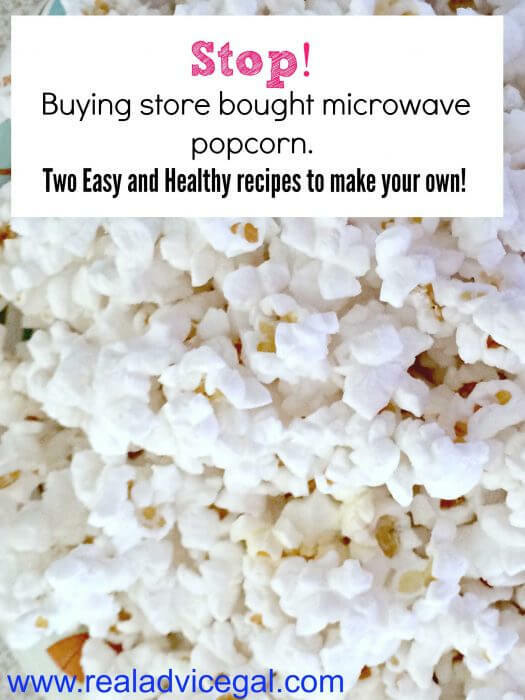 Here’s a super cheap and easy Healthy Homemade Microwave Popcorn tip. 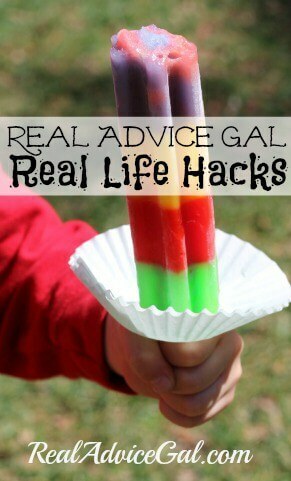 Use a cupcake pan liners to catch drips from melting popsicles. 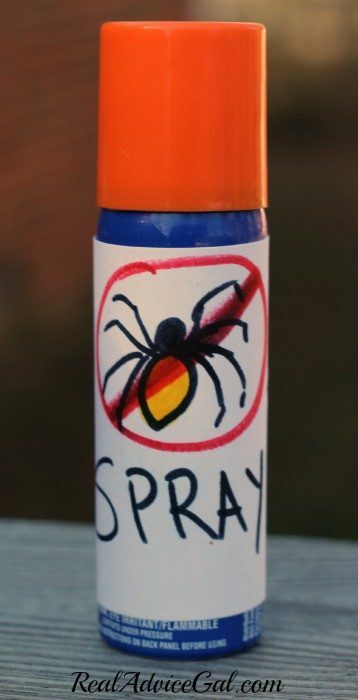 Use a travel size bottle of static guard, febreeze, or wrinkle releaser as fake spider spray to convince your frightened child that the spiders won’t be back in the middle of the night. Our little one is afraid of spiders but you could use this to keep the ghosts away or anything else keeping your kids up at night in fear. Use an apple slicer to slice a whole apple about 3/4 of the way through the apple. 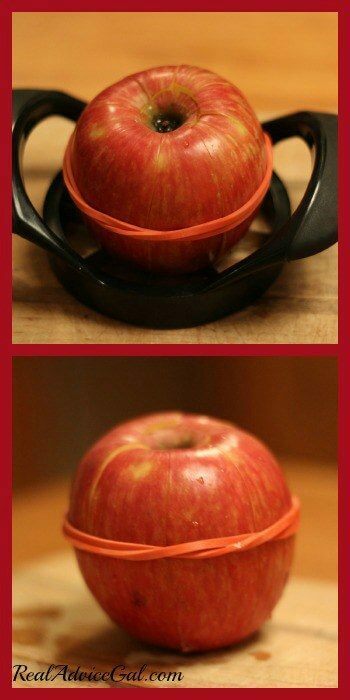 Put a rubber band around the entire apple. Finish cutting through the apple pushing apple completely through the slicer. The rubber band holds the apple together so that the apple doesn’t turn brown. 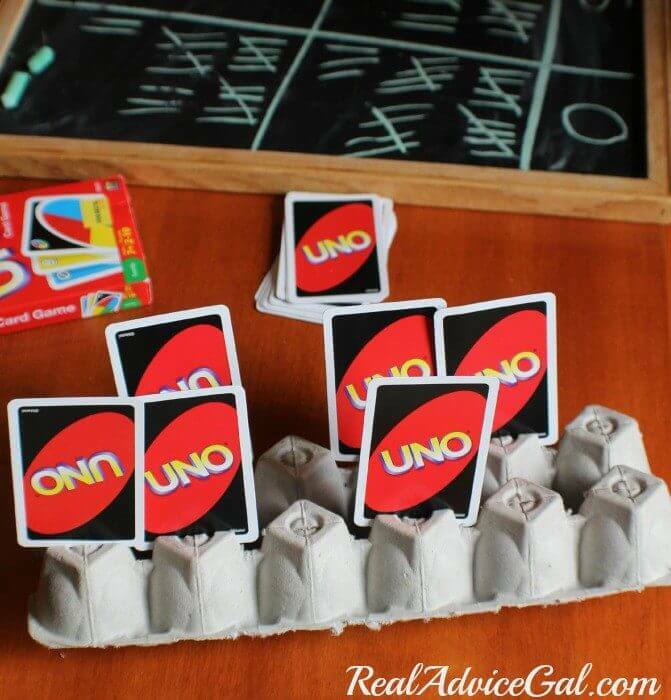 Use a cardboard egg cart to make a card holder for little hands. Just cut slits in the bottom of each egg cup, the cards slide right in and your youngest players can see their whole hand. Cardboard egg cartons work best but you could also use a Styrofoam one. I bet all of you super savvy moms are already doing this one but I always forget and rip the foil top right off the chocolate milk. Then I am afraid it will get spilled during the rest of the meal. I have to use a fork to poke the hole and make it big enough for the straw but this is so much less messy than a completely open top. 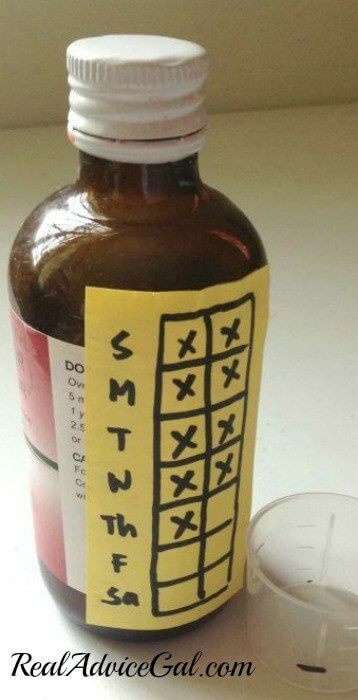 Put a simple chart on medicine bottle so you can easily keep track of the days and times you administered the medicine. This makes it so much easier to make sure you don’t forget a dose. 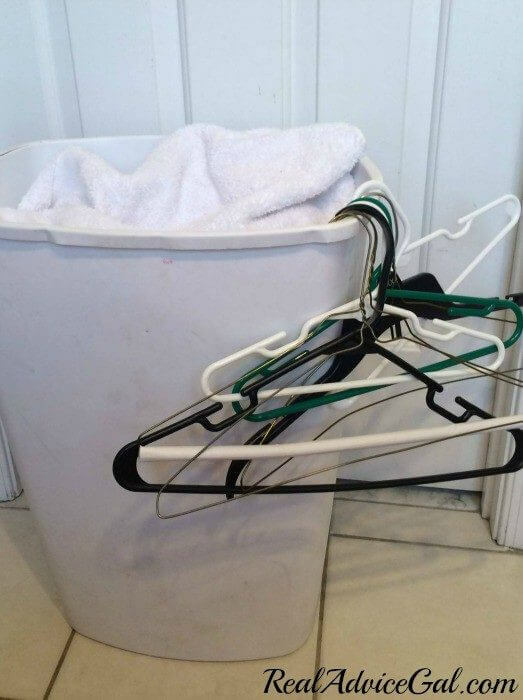 When folding laundry hang your hangers on the side of the laundry basket, they are within easy reach and not a tangled mess on the floor or counter. 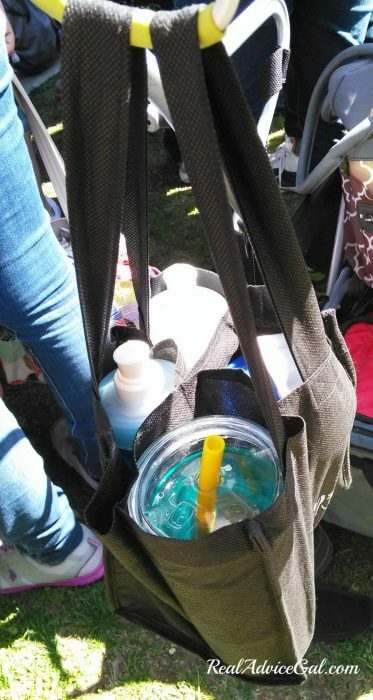 Use a reusable wine bottle bag to hold drinks, can be hung from the stroller using a stroller hook or used to take water bottles for the whole family to the soccer field. 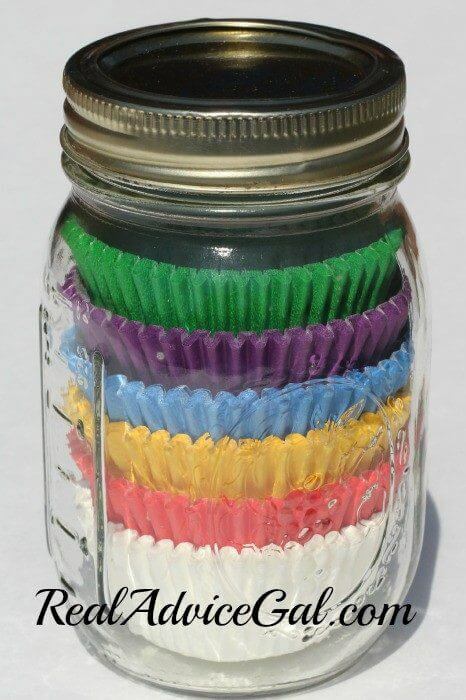 Use a mason jar for your cupcake liners. They keep there shape and are all in one place. 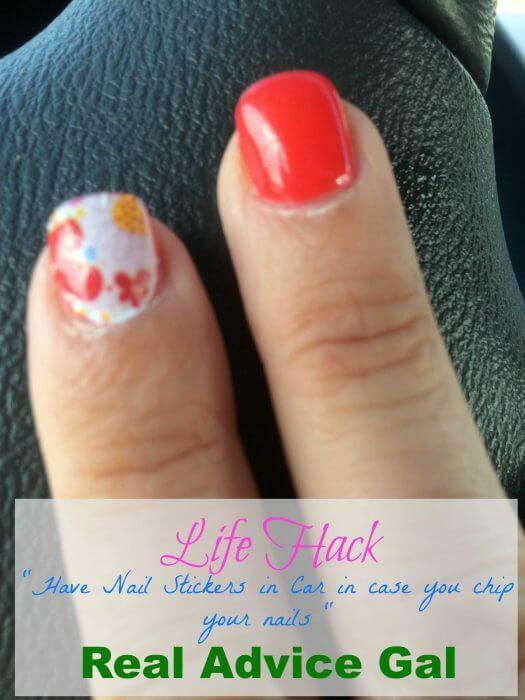 If you chip your nail just have some of those stickers on hand to put one on top. Voila, artwork not a big disaster! 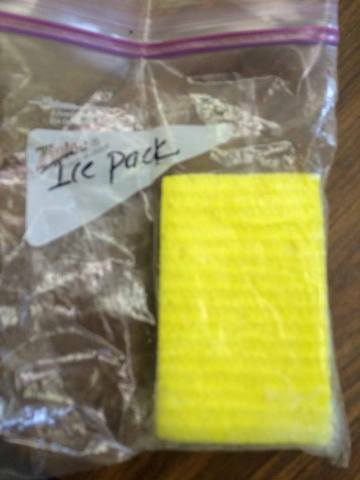 DIY Ice pack – Saturate a sponge with water then freeze it. Place it in a Ziplock bag for a no drip ice pack. 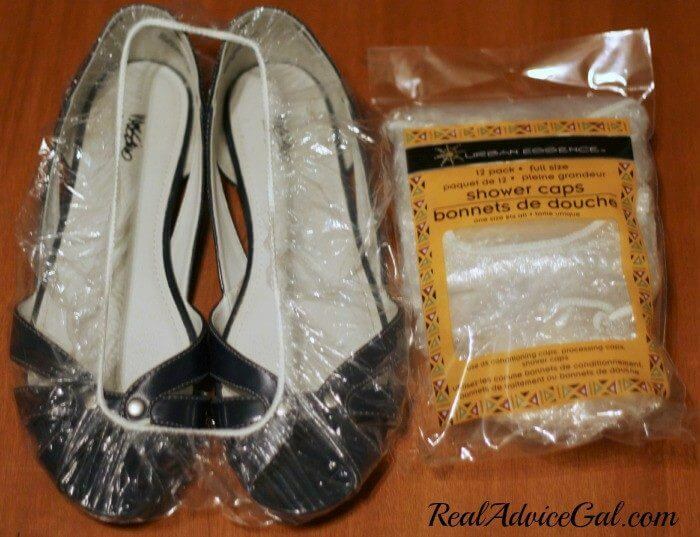 Use a shower cap to cover your shoes so you can pack them in your suitcase without soiling your clothes. Shower caps are really inexpensive. I picked up a 12 pack for $1 at the dollar store. 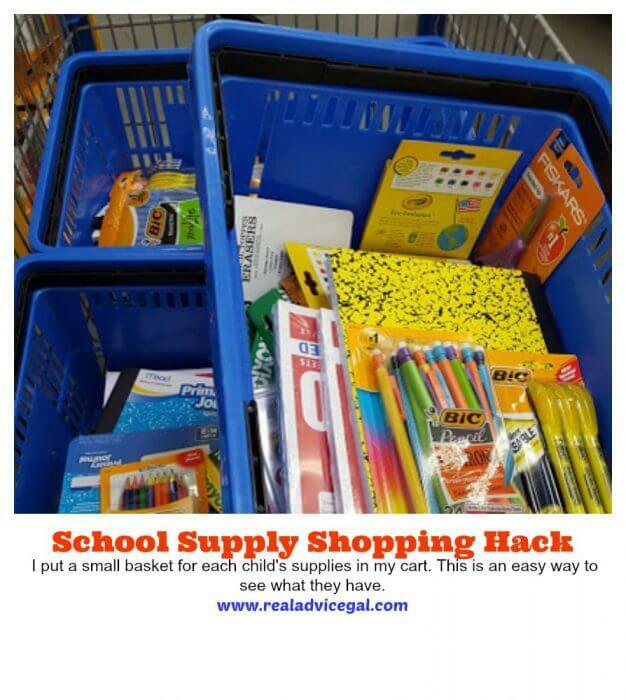 This is a great way make sure you get all the supplies you need. The kids are also able to take ownership over their supplies. 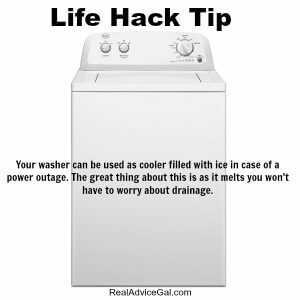 Tip: Your washer can be used as cooler filled with ice in case of a power outage. The great thing about this is as it melts you won’t have to worry about drainage. As it melts you won’t have to worry about drainage..when power comes back on empty contents and run rinse cycle the melted water will drain.